An article appeared in a recent Daily Graphic, Ghana’s oldest daily, about the Ejisuhemma, the Queen Mother of Ejisu and a direct descendant of warrior queen Yaa Asantewaa. 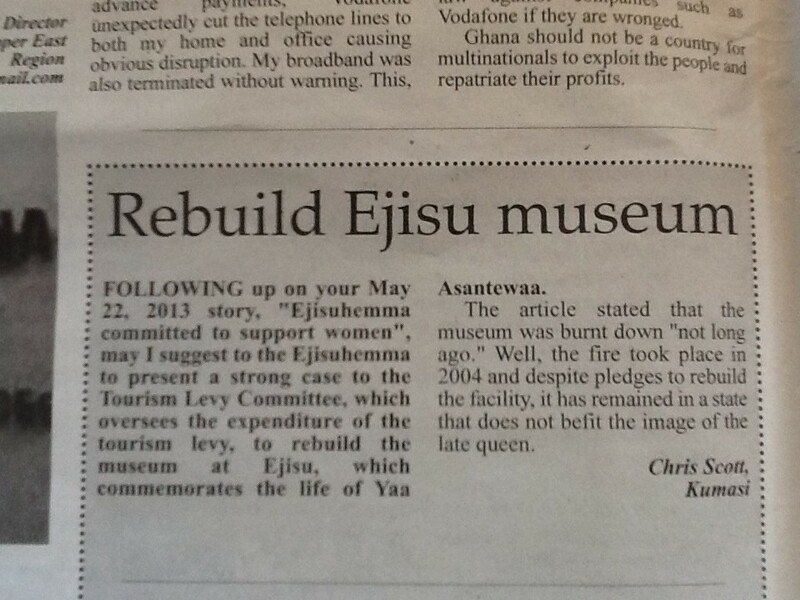 Near the end of the article, there was mention of the Yaa Asantewaa museum which burnt down a long time ago . I have used this occasion to write a letter to the editor to suggest that the queen-mother approach the committee overseeing the spending of the newly established tourism levy account. Tourists are being taxed 1 % on all purchases/rates in the hospitality sector. The money goes into a fund to be used for various purposes including infrastructure development. Once upon a time, the Yaa Asantewaa Museum, a recreation of her living quarters, was a wonderful place to visit along with the nearby craft villages and the Besease traditional house, a UNESCO site, all just outside Kumasi. Now you may think I’m crazy, but I feel an affinity towards Yaa Asantewaa. Ya I know she was a woman, and I am a man. Ya I know she was black, and I am white. Ya, I know she was fighting the forces of a foreign occupier in 1900-1901, and I am campaigning for policy change by the ruling democratically elected -the court is sitting on this one- Government of Ghana in 2013. 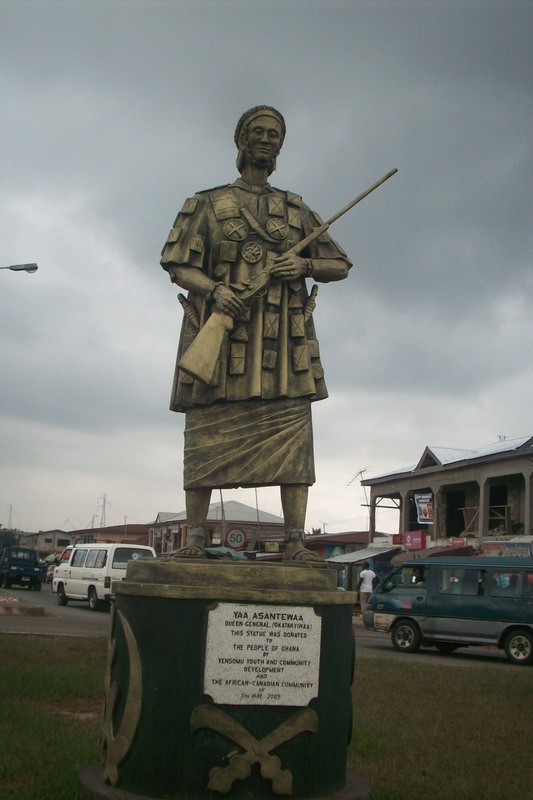 Ya I know she was fighting to keep the British from stealing the Golden Stool, the embodiment of the soul of the Ashanti, and I am fighting for an increase in tourist arrivals. But I think tourism can be at the heart of the Ghanaian economy, creating employment, alleviating poverty and generating tax revenues for development, all the while giving Ghana’s hospitable people routine, purpose, and success. Anyways, a little ole woman and a little ole man-both left holding the bag while the powers that be cowered away in 1900-01 and have cowered away in 2013….